I was looking for a bin rental company in Bolton and we decided to go with Bin There Dump That Bolton because of the pleasant and professional phone call we had with them. They were very informative and their bin rental service was just as professional. Great dumpster rental company in Bolton. David Baker & Matt Baker are your Bolton bin rental operators. We are a father and son team working together to making the bin rental process in Bolton and surrounding areas a seamless and pleasant experience. 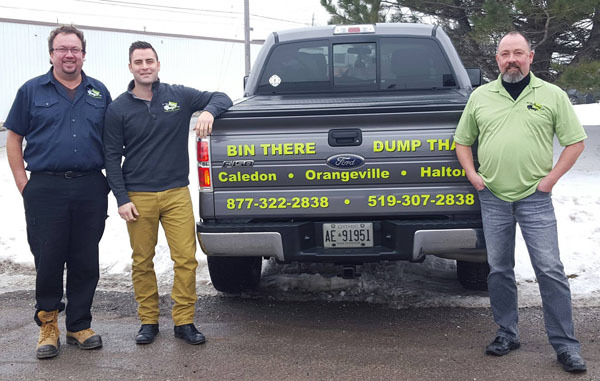 With both of us having a real estate background and Matt also being a full time firefighter we are customer first oriented and we are ready to accommodate your bin rental needs for any size project big or small. So if you need to rent a bin in Bolton or any of the surrounding areas, give us a call and speak with one of bin rental specialists who will be glad to answer any of your bin rental questions. With Bin There Dump That Bolton, you are guaranteed to receive the best! We have the best rental bins, the best specialists and provide the best customer service. Our rental bins are also of high quality and are also thoroughly cleaned before being delivered to the next customer. These bins of ours come in different sizes that are between the sizes of 4 yards to 20 yards and they even have doors on them to provide easy access to remove all of your unwanted garbage. Our customers are our number one priority as we want to ensure that they all have a positive experience with us. We are very easy to get in touch with and would go above and beyond to accommodate all of our customers needs. Our wonderful bin rental specialists are looking forward to speaking and working with you! Bin There Dump That Bolton is the bin rental service to call!